Classical music is often typecast as mired in the past, and with good reason – just consider the vast majority of CDs and concert-hall programs, which consist almost entirely of repertoire at least 100 years old. Yet, the composers of the past whom we most admire (in retrospect, that is – they often struggled to appeal to their own audiences) were not the conservatives but rather those who were in the forefront of innovation of their eras or who found and developed a contemporary niche without looking backward. Johannes Brahms was different – he unabashedly turned to the past for contemporary relevance. Harold Schonberg dubbed him "The Keeper of the Flame." 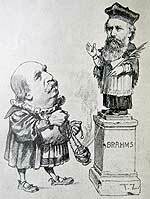 In the raging cultural war of his time, Brahms came to be regarded as the pillar of conservatism and was vaunted by the influential critic Edward Hanslick as a pure musician whose work was imbued with intrinsic beauty, a rampart against the threat of Wagner and the progressives who sought to express personal thoughts and feelings in their music. Indeed, the activists fought Brahms with a vengeance – Hugo Wolf condemned his art as one of composing without ideas, a trick of making something out of nothing. Yet as Leonard Bernstein noted, while Wolf's remark was intended as an indictment, in fact it is the key to Brahms' greatness, and indeed encapsulates the essence of symphonic form, in which rudimentary materials are developed so as to generate a universe of meaning. In that light, Julius Harrison sees Brahms as filling a more complex role as a bridge between past and present, melding the classical architecture of the past with the soaring sound of his own era. Even so, every composer fills that role, even if unintentionally, as all innovation is founded upon the achievements of the past – as the great conductor Wilhelm Furtwängler put it, just as old earth must be tilled to grow new crops, in art something fresh can be created out of something that is already established. Furtwängler went on to credit Brahms as a sort of radical – the first great composer who proudly stood apart from the trends of his time because they did not satisfy his needs, an artist who rose above his historic function, an individual who had to defend himself to be what he was, the creator of art that was independent of history and that was founded upon inner logic. As John Ardoin observed, the challenge of Brahms transcended the simplistic friction of new versus old or innovation versus tradition – he plunges us into the deeper and eternal impasse of man versus his times. We all feel pressure to conform or rebel, but Brahms just did his own thing – a thoroughly bold and modern attitude for a supposed conservative! Brahms' sense of history was well-informed, as he was the first great composer who was also a musicologist. His interests and knowledge not only embraced the folk music of his time but extended back through Palestrina to the dawn of our musical heritage in the 16th Century. The depth of Brahms' scholarship is evident throughout his career, and never more so than in his fourth and final symphony. Thus, the first movement of the Fourth is built upon the simplest of motifs – a mere two notes in a falling third and, by raising the second note an octave, a rising sixth, and their respective inversions. In a sense, Brahms tweaked his enemies' reverence for Beethoven, whose revolutionary Fifth Symphony was celebrated for being based on a four-note phrase, but here Brahms trumped him by using a mere two! Even then, Brahm's revolt was steeped in musical history – as the theme unfolds in the strings, it is echoed by the winds to form a canon, one of the very earliest musical devices. Indeed, this opening is a prime example of Brahms's natural ability to compose within the strictest and oldest of structures, yet with a fluid, modern sound that belies its rigidity – as Jan Swafford has pointed out, if octave displacements in the free-flowing lyric melody are disregarded, we have nothing more than eight descending thirds, followed by a gentle ascent, boringly monotonous material that Brahms transforms simply and elegantly with lilting fascination. the sonata form of the preceding classical period, with two thematic groups (one assertive, the other lyrical) presented, developed and recapitulated; and from the earlier Baroque era a passacaglia, in which a simple bass figure is constantly repeated without alteration. In keeping with his penchant for scholarly research, Brahms derived his theme from the then-unpublished and thus unknown 150th Cantata of Bach, the master of the Baroque whose chaconne (essentially a passacaglia) for solo violin Brahms worshipped. Brahms adapted Bach's theme by adding a leading tone and regularizing the rhythm into eight dotted half notes rising from tonic (e) to dominant (b), dropping an octave and then returning to the starting note. In developing this material into a symphonic movement, Brahms observes a strict structure of 30 variations and a coda with no change of key (other than a brief E-major episode). Along the way, Brahms manages to evoke and summarize the efficient economy and descending thirds of the opening movement, the poignant modal tension and lyricism of the second and the ecstatic vigor of the third, all while presenting a huge variety of mood, texture, color and rhythm seamlessly combined with a smooth logical flow of cumulative momentum that seems wildly inventive but in fact at all times is tightly controlled and nestled within a fundamental aura of dignity and reserve. Walter Frisch called the finale of the Brahms Fourth the most extraordinary symphonic movement between Beethoven and Mahler, and Julian Haylock credits it with a level of technical ingenuity that surpasses almost anything else in the symphonic repertoire. As Swafford notes, most minor-key music enacts a drama from darkness to light and fatality to triumph by turning to the major mode by the end, but here the culmination is resolutely minor. Swafford sees this as an autumnal reflection in which Brahms summarized the essence of his work and his cultural tradition, reflecting both his apprehension of the onset of old age and his symbolic recognition that he was the last of the line of the music-loving Austrian middle-class. Yet the Fourth concludes not in capitulation but rather in a rush of energy – the brief coda tries to restate the theme, gets stuck on the fifth and only chromatic note, then plunges forward with resolute energy that fragments the theme, abrades the prevalent tonality, and finally rises to a gesture of ringing defiance. When Brahms previewed his new symphony in a two-piano version for a circle of close musical friends, apparently they grasped and chafed against the edgy undercurrent beneath its conservative trappings. The sycophantic critic Hanslick recalled that the friends argued, pummeled the first movement and urged Brahms to publish the finale as a separate work, jettison the third altogether and write more conventional substitutions. Yet, while their reaction bolstered his own misgivings, with barely two weeks before the premiere Brahms had little choice but to proceed. Brahms conducted the first public performance in October 1885 with the Meiningen Orchestra, which then took the work on a 14-city tour. The choice of ensemble was significant to evoke his aural image. Although Brahms had prepared his previous two symphonies for the Vienna Philharmonic, his home-town orchestra, the 48-member Meiningen was barely half as large and Brahms reportedly declined an offer to augment it. The resulting lean texture and instrumental balance harked back a century to the classical court bands familiar to Mozart and Haydn, before volume soared and massive string sections came to dominate orchestral textures. The Meiningen tour of the Fourth was led by its permanent conductor, Hans von Bülow, the first of the great orchestra leaders who wasn't also a composer, and who thus became the model for those who dominate our own time. Reportedly meticulous, he not only memorized all the scores he led but required his musicians to do so as well – and to play while standing. According to Hanslick, such quirks paid off, as Bülow achieved a degree of nuance previously only possible with piano soloists. According to Richard Specht, Brahms himself was reputed to be an erratic conductor – sensitive but unequipped to deal with the mechanics of preparing a cogent performance. Eugenie Schumann, one of his piano students, recalled that his own solo playing was warm in tone and elastic in rhythm, often lingering on a phrase without any subsequent acceleration to make up the time. Indeed, the score of the Fourth is full of hairpin (<>) accents over extended notes to indicate short swells. A key to Brahms' podium style lies in a minutely detailed account by Walter Blume of the Brahms symphonies as conducted with considerable inflection by Fritz Steinbach, who succeeded Bülow at the helm of the Meiningen from 1886 to 1903 and whose work Brahms approved. 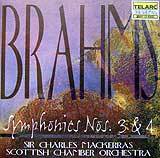 A 1997 recording by Charles Mackerras and the Scottish Chamber Orchestra (Telarc CD) follows the Blume description and revives the trim sonority, delicate phrasing, precise dynamics, prominent winds and braying brass presumably familiar to the composer. While somewhat more adventurous than the temperate readings that predominate nowadays, the overall sound lies comfortably on ears accustomed to original instrument baroque and classical performances, and while Mackerras considers some of Blume's tempo variations, unmarked in the score, to be "violent," they seem moderate and rather judicious. The historically-informed approach had been paved in a 1994 EMI CD by The London Classical Players led by Roger Norrington, who emphasized replication of the sheer sound of the Brahms orchestra more than interpretive nuance. Brahms, though, left confusing clues to his own outlook. He deemed Richter's performances of his work dull, gray, uninspired and misunderstood, yet he praised Richter's successor, Felix Weingartner, known for his classical restraint, as a "healthy, fresh personality," who gave "truly wonderful" performances of the Symphony # 2 that were "a mirror" of Brahms's own conception. He also variously praised Bülow and condemned his readings as "calculated for effects," asserting that he would have marked more inflections in the score had he intended them. Perhaps the best way to reconcile these seemingly conflicting views is offered by Frisch, who credits Brahms as having no fixed image of how his work should sound and being open and responsive to any compelling performance. Indeed, in an 1886 letter to Joachim, he stated that the expressive markings in his scores were useful for a first performance by an orchestra unfamiliar with the work, but encouraged natural modifications once conductors knew the music. Consistent with this outlook, Brahms crossed out many of the tempo indications from his autograph score prior to publication, presumably so as to encourage performers to sense their own style. 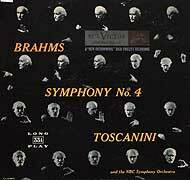 In any event, this wide range of approaches to performing Brahms is fully evident in the first decade of recordings of the Fourth. We have only two recordings of the Fourth from conductors who knew Brahms first-hand, and they represent the poles of interpretive approaches. 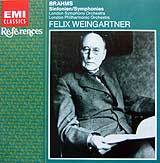 Felix Weingartner (1863 - 1942) recorded his interpretation with the London Symphony in 1938 (EMI), nearly a half-century since he had worked with the composer. Fundamentally steadfast, restrained, subtly inflected, elegant and shorn of rhetoric, he effortlessly integrates the work's elements and displayes its essential structure with dignity. In keeping with his straightforward approach and refusal to indulge in hyperbole, his traditionally slow andante movement is the fastest on record, while his normally animated scherzo is the slowest, yet all seems wholly natural, a blend of relaxation and assurance that keeps all the elements in a confident balance that never threatens to supplant the composer's personality, thus inviting us into the interior world of Brahms. Max Fiedler (1859 - 1939) only took up conducting after Brahms died, but the composer admired his piano playing and they became close friends. His 1930 recording with the Berlin State Opera Orchestra (Biddulph) announces its individuality from the very outset, as the opening emerges slowly from the background hiss, then gallops off at the first embellishment in bar 9. Highly impulsive and mystical, Fiedler's work is constantly alive with emphatic phrasing, tempo extremes and bold expressive touches that announce an equal partnership between composer and interpreter and a deeply personal journey to find passion beneath the surface of the objective score. Yet, it's just as persuasive and organic as Weingartner – and, while strikingly different, thoroughly convincing and idiomatic. The very first complete cycle of Brahms symphonies on record came from an unlikely source – Leopold Stokowski. Begun in 1927, by the time it was completed with the Fourth in 1933 at the height of the Depression, the producers required austerity and used barely half of the Philadelphia Orchestra. The result (on Biddulph) has a lovely, responsive chamber-like quality that evokes the texture of the original Meiningen ensemble. In lieu of his usual trademark rich orchestral texture, Stokowski compensates with close miking for intimate responsiveness and leads a fleet, ardent performance with strongly individualized touches – a heavily romanticized andante, a startlingly vivid return of the scherzo theme and a finale of intensely characterized variations. 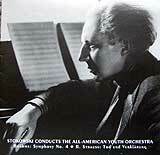 A superb 1940 remake with his All-American Youth Orchestra (Music & Arts) enabled Stokowski to exploit the freshness and enthusiasm of his student players, to revel in their freedom from routine and to share their contagious thrill of discovery. His final recording with the New Philharmonia (1974, BMG), is a stunning fusion of vigor and insight, propulsion and logic, from the perpetually youthful 92-year old conductor. Preceding both Weingartner and Fiedler, the very first complete recording of the Fourth appears to have been by Hermann Abendroth conducting the London Symphony in March 1927. All the traits of an activist conductor are fully apparent – using the score as a starting point, rather than a rule book, so as to project a deeply-involving aura of spontaneous, personalized creation rather than mere dutiful devotion to the indications of the score. Thus, Abendroth's andante is soft, sweet and mellow, his scherzo dramatic, with a clear disconnect between the gentle trio and the explosive return of the frantic opening, and his finale dark, deadly serious and grimly insistent upon formal integrity, with varying tempos that constantly prepare for the return of the principal theme at each structural apex. Although credited as the single-handed innovator of the modern objective approach to performance, Arturo Toscanini trod the path Weingartner had blazed, but with compelling intensity. 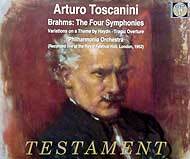 His 1935 BBC Symphony concert recording of the Fourth (EMI) is potent, but focused on detail, momentum, precision and formal balance, with just enough accentuation and subtle pacing variance to humanize the result right up to the stormy, tympani-drenched end. His 1951 NBC Symphony recording (BMG) is among the best of his late studio efforts, clean and sharp, its adherence to a basic pulse creating a sense of inevitability that underlines the firm structure. NBC concerts from 1948 (EMI) and 1951 (Arkadia), combine the drama and accents of the BBC concert with the driven urgency of the NBC studio record. A magnificent 1952 Philharmonia concert (Testament) is perhaps his finest account, avoiding the dry culmination that afflicts all his others. Willem Mengelberg and the Concertgebouw (1938, Biddulph) raise the bar through the sheer quality of the orchestral playing – their extreme polish, precision and exquisitely shaded dynamics (not always congruent with the score)enable them to create meaning on level of subtlety that otherwise would be obscured by performance mechanics, as even the slightest swell of volume, acceleration or shift in instrumental balance permits a search for its significance that vastly enriches the listening experience. They also invest their performance with an extraordinary degree of subtle tension. Their orchestral sound of ravishingly smooth beauty and overall gentle sweetness is thrown off kilter by quirky phrasing (repeated to avoid suspicion of a mere lapse) – a pause in otherwise metrically regular phrases at measures 67-71 of the opening allegro non troppo exposition (and repeated at measures 311-15 of the recapitulation), metric irregularity in the clarinet figures at measure 20 of the andante. Mengelberg's finely graded execution tends to exemplify the benefit of restraint in Brahms performance. 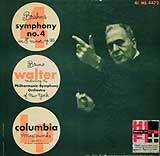 The first decade of Fourth recordings is rounded out by Bruno Walter leading the BBC Symphony (1934, Koch) and Serge Koussevitzky leading the Boston Symphony (1938-9, Lys). Both are relatively straight-forward, brisk and light. Walter adds a few slight pauses to mark structural highlights and a suggestion of Viennese lilt. Walter's 1948 recording with the New York Philharmonic is considerably more generic and serves as a bridge between his earlier and final styles. His final Columbia Symphony stereo remake (1959, Sony) would take transparency to the extreme, its pure beauty letting the structure shine unencumbered. While unremarkable in comparison to the more inflected, personal accounts already noted, all of these are good, solid readings that convey the essence of the piece and clearly led the way to subsequent acclaimed readings by Klemperer, Haitink, Karajan, Kleiber, Bernstein and many others who, in turn, anticipated the current crop of impersonal and interpretively neutral performances. But standing apart from all the others is Wilhelm Furtwängler. Like Brahms, Furtwängler rejected the modern trends of his time, both as a composer (avoiding any influence of 12-tone, atonal and jazz-inflected writing) and as a performer (never settling for objectivity). As John Ardoin noted, Furtwängler identified closely with Brahms – both politically and professionally, each was enmeshed beyond simplistic controversies of old versus new but instead became embroiled in the far deeper issues of man's essence versus the demands of his times. With Furtwängler, we no longer hear merely pleasant and interesting arrangements of sound but rather plunge into a world of mysticism and cosmic significance for a haunting, probing journey that unleashes the powerful emotions surging beneath the surface. Of his several recorded concerts of the Brahms Fourth with the Berlin Philharmonic, the one from 1943 (Music and Arts) is the most intense but weakened by deficient sound, while another from 1949 (Tahra) is nearly as compelling and thoroughly remarkable. Furtwängler fully internalizes the work and then regenerates it with vast spontaneity, yet driven by searching intelligence and thorough control, producing a commanding personal statement that manages to enhance, rather than overwhelm, the splendor of Brahms. The finale, in particular, is terrifying in its extremes and persistent drive, an experience on record never equaled before or since, and an enduring testament to an utterly unique work of genius by both composer and artist. Of the many available biographies and specialized books, I found especially helpful Jan Swofford's Johannes Brahms (Knopf, 1997) and Walter Frisch's Brahms – The Four Symphonies (Schirmer, 1996). Leonard Bernstein provides an insightful yet accessible analysis of the structure of the first movement in his Infinite Variety of Music (Simon & Schuster, 1966). Furtwangler's cogent views of Brahms' historical and aesthetic significance are summarized in John Ardoin's The Furtwangler Record (Amadeus Press, 1994). Significant analyses of the performing style of Brahms' time and the challenges faced by modern interpreters and ensembles are given in Robert Pascall's notes to the Mackerras Telarc CD and Roger Norrington's notes to his own EMI CD. copyright © 1998-2007 Peter Gutmann. All rights reserved.